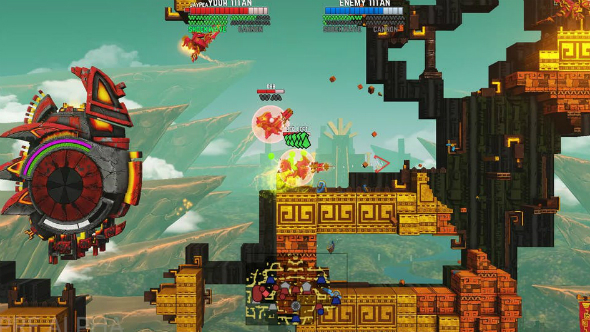 Billing itself as one of the first ‘Stonepunk’ games, Antegods is a Mayan-themed arena shooter set in a universe where the remnants of the Mayan civilization have upped sticks and buggered off to space. It’s just launched its crowdfunding campaign with the help of Kickstarter-like Fig and is off to a flying start, having already raised nearly a quarter of its $70,000 goal in its first day alone. For more crowdfunded beauties, check out the best indie games on PC. The team-based arena shooter sees players take control of fully-customisable Mayan mechs that make for perfect intergalactic arena warriors. Arenas are procedurally generated 2D maps and are highly destructible. Matches set two teams up against one another in a hunt to accumulate energy where the ultimate goal is to activate Titan statues that will reign fire down on the opposition. You can see it in action in the trailer below. Why all the intergalactic, ancient-civ bloodshed? Apparently it’s all part of the greatest competition in the universe: the Intergalactic Antegods Tournament. Whoever wins these tactical battles climbs a tournament ladder, becoming gods themselves after enough victories – we’re not exactly sure whether that last bit about becoming a god will factor into the gameplay, but we certainly hope it does. The title has been chosen and part-funded by Fig, with its release date set for Spring 2018, if it sounds like your cup of the proverbial you can support it here.